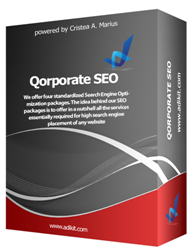 Corporate Search Engine Optimization is an industry leading SEO company providing customized search engine marketing solutions for the past decade.We offer four standardized Search Engine Optimization packages. The idea behind our SEO packages is to offer in a nutshell all the services essentially required for high search engine placement of any website. If your site can be found for the right search phrases you will make money. ...... of traffic to a web pages search results. Typically, the earlier a site appears in the search results via "natural" ("organic" or "algorithmic") search results, the more visitors it will receive from the search engines. SEO may target different kinds of search, including image search, local search, and industry-specific vertical search engines. Qweas is providing links to Qorporate SEO 1 as a courtesy, and makes no representations regarding Qorporate SEO or any other applications or any information related thereto. Any questions, complaints or claims regarding this application Qorporate SEO 1 must be directed to the appropriate software vendor. You may click the publisher link of Qorporate SEO on the top of this page to get more details about the vendor.